To protect oak trees from the often-fatal oak wilt disease, don’t prune, cut or injure oak trees from April through July. Pruning and cutting oaks in spring and early summer leaves them vulnerable to oak wilt, which rapidly kills trees in the red oak group and weakens those in the white oak group. Any damage during this time, including broken branches caused by storms, exposes living tree tissue beneath the bark and provides an opportunity for the oak wilt fungus to infect the tree. 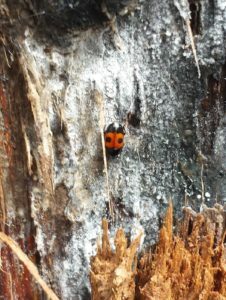 Sap-feeding beetles introduce the disease by carrying oak wilt spores from infected trees or firewood to fresh wounds. Healthy oaks can become infected in as little as 15 minutes after the creation of a wound. Sap-feeding beetle on diseased oak tree in Sawyer County. The trees most likely to die from oak wilt infection are in the red oak group, including northern pin oak, northern red oak, red oak and black oak. The white oak group is more likely to survive infection and includes bur oak, swamp white oak, white oak and English oak. Tree paint or wound dressing is not normally recommended on pruned or wounded surfaces, but for damaged oaks an immediate light application of these products may be the only defense against oak wilt infection from April through July. Pruning in spring can be damaging to any deciduous tree because their energy reserves are low as they produce new buds and leaves following the winter months. In general, the best time to prune is in winter when trees are dormant. 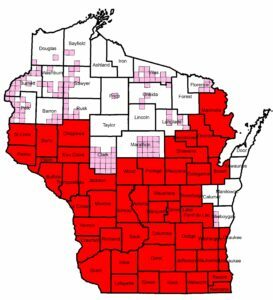 As of January 31, oak wilt has been found in all Wisconsin counties except Ashland, Iron, Forest, Taylor, Door, Kewaunee, Calumet and Manitowoc counties. Several of these counties contain the highest abundance of healthy and productive oak forests in the state. Taking recommended precautions will help keep them that way for years to come. Oak wilt and other diseases move easily on or in firewood logs year-round, so keeping firewood local, or purchasing Wisconsin-certified firewood, is another important component of protecting trees and keeping forests healthy. Visit the DNR firewood page for more information and a directory of certified firewood vendors. More information, including a recently released oak wilt video, is available at the DNR oak wilt page. Additional information about proper pruning techniques is available from community foresters or through DNR resources such as this tree pruning poster. Spring is the best time to evaluate valuable ash trees and determine if they should be treated to protect them from emerald ash borer (EAB). Emerald ash borer is currently the most damaging threat to trees in the state, killing more than 99 percent of the ash trees it infests. Insecticide treatments to prevent EAB infestation are usually applied between mid-April and mid-May, so it is important to start planning now. The first thing homeowners should do is check their ash trees for signs of infestation. Woodpecker damage is easy to see this time of year and is often the earliest visible sign of EAB. Photos of other signs and symptoms can be found on the DNR EAB website. Signs of EAB infestation include woodpecker damage where the birds pick away ash tree bark to feed on larvae. 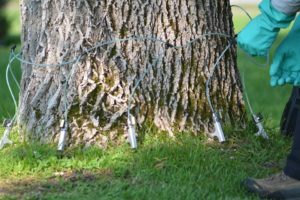 Emerald ash borer has become so widespread that homeowners should consider treating valuable ash trees no matter where they are in Wisconsin. The highest risk of EAB infestation is within 15 miles of a known infestation, but it is widely believed that there are additional, undetected EAB infestations throughout the state. To see a map of known EAB infestations, visit the Wisconsin EAB website. While the best time to treat ash trees is before they are infested, treatments of infested trees can still be successful if done while EAB populations within the tree are low or moderate. Some ash trees may be too heavily infested to save or they may have other problems that make them poor candidates for treatment. Trunk injection treatment to protect against EAB. Credit: Matthew Karst. You should consider several factors when deciding whether to treat your ash trees. Insecticide treatments can be costly, but the investment may be worthwhile if you consider the many benefits that healthy yard trees provide, including higher property values, better air quality, shading and cooling for homes and more. Removing and replacing your ash trees is another option and may be the best choice for heavily infested and lower value trees. For trees that you decide are worth saving, however, the cost to treat may still be less than removing and replacing them with other species. This factsheet from UW-Extension can help you decide whether a tree is worth treating. If you decide to treat, or if you want to discuss treatment options with a professional, call a certified arborist or search online and in phone books for other businesses. Check the credentials and insecticide applicator certification of any business before hiring them to treat your ash trees. Treatments are not economically practical for ash found in woodlots. Any questions about woodlot management should be directed to a professional forester. Despite the cold winter temperatures in late January and early February, don’t postpone treatment of ash trees. Weather data and collection of overwintering EAB larvae at two sites in Waukesha County predict high insect survival rates in most of the state. Female beetles can lay up to 200 eggs, so EAB populations will quickly rebound from any mortality that occurred due to cold weather. More information about EAB and management options can be found through the Wisconsin EAB website. Gypsy moth eggs should start hatching in a few weeks as temperatures continue to warm. Homeowners should survey their trees for egg masses and either treat or remove the eggs now to help protect trees from defoliation and reduce future caterpillar populations. Property owners should start by looking for the egg masses. They can be found on nearly any outdoor surface, including tree trunks, undersides of branches, buildings, firewood piles and other outdoor objects. They are tan-colored lumps about the size of a nickel or quarter. Each egg mass can contain 500 to 1,000 eggs that will soon hatch into hungry caterpillars. While statewide gypsy moth numbers are currently low, isolated trees and locations may have high populations. 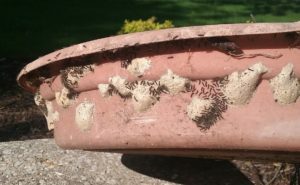 Gypsy moth larvae hatch from egg masses on outdoor bowl. If egg masses are found, there are two options to help reduce pest numbers. Available at many garden centers and retail stores, horticultural oils that suffocate the eggs can be directly applied to the masses. These are most effective when temperatures are above 40 degrees and a return to freezing is not imminent. Alternatively, egg masses within reach can be scraped into a can of soapy water and left to soak for a few days before being discarded in the trash. Insecticide treatments may be appropriate for larger trees that have many egg masses. Some types of treatment are done before eggs hatch, and some are done while the caterpillars are small. Property owners looking to hire a business to treat large yard trees this spring should contact them soon. A list of certified arborists is available on the Wisconsin Arborist Association website. Additional businesses offering insecticide treatments may be found online or in a phone book. 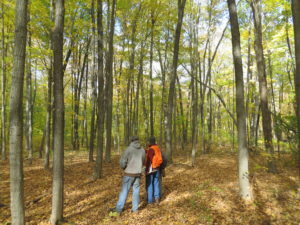 Questions about woodlot management should be directed to a professional forester. Additional information about management options for homeowners, including sticky barrier bands and burlap collection bands, is available at the Wisconsin gypsy moth website. 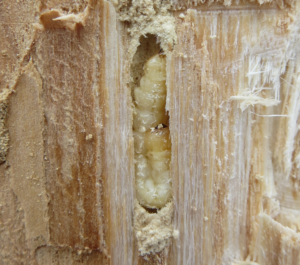 The recent frigid temperatures in late January and early February are likely to kill many overwintering emerald ash borer (EAB) larvae, but the tree-killing pest isn’t going away. The insulating properties of tree bark keep the larvae warmer than the outdoor air temperature, and wind chills do not affect the larvae because they are sheltered. The pest is also adapted to subzero temperatures based on its native range in eastern Asia where cold winters are common. Overwintering prepupal larva, from February 2019 in Brookfield, WI. On the morning of January 31, many parts of Wisconsin had low air temperatures between -30 and -35 degrees F. In places where it was this cold, scientific studies predict that most EAB larvae will be killed. Where low temperatures were between -20 and -30, larval mortality is likely to be lighter. Overwintering larvae were examined about 1 week after the cold snap in Brookfield (Waukesha County), where the low was -26, and few of the larvae were observed to have physical signs of freezing damage. Many of the larvae began moving within three days of being brought indoors. However, physical damage to the larvae may not yet be apparent, and normal-looking larvae may ultimately die from the cold temperatures. Populations of the pest are likely to rebound, since each female beetle that emerges this summer will lay as many as 200 eggs. It is not currently known if larval mortality will significantly delay ash tree decline and mortality, although this may occur in areas that experienced the lowest temperatures. A cold spell in early 2014, that was not quite as cold, had no noticeable impacts on EAB spread or ash decline/mortality in areas known to be heavily infested. The introduced biological controls of EAB, commonly known as “EAB wasps,” are at least as cold-tolerant as EAB. It is expected that these wasps will persist in and around release sites and continue parasitizing EAB eggs and larvae. Forestry experts do not recommend changing EAB management plans solely due to the cold weather. Continue to look for EAB in ash trees. 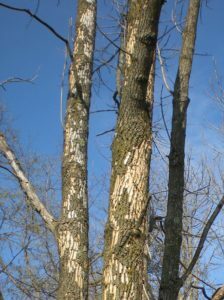 Woodpecker damage is a good sign that an ash tree is infested with EAB or other pests. Insecticide treatment of high-value ash trees near known infestations should be continued this spring. Don’t delay tree removals or timber harvests that are already scheduled. Giving non-ash tree species more time to grow means that the future impacts of EAB will be reduced. Continue planting non-ash tree species. To help slow the spread of EAB, review firewood rules in Wisconsin. Buy firewood in the local area where you plan to burn it or buy Wisconsin-certified firewood that has been treated to eliminate pests. Certified firewood is often available at DNR-managed properties or you can buy from an independent certified firewood dealer. Additional information about emerald ash borer, insecticide treatments and forest management can be found online at www.emeraldashborer.wi.gov. By Bill McNee, forest health specialist, Oshkosh, Bill.McNee@wisconsin.gov, 920-360-0942. The Wisconsin Department of Natural Resources has released updated guidelines to aid woodland owners and managers in managing ash stands in light of the invasive emerald ash borer (EAB). The guidelines that became effective on January 1, 2019 reflect new research, increased pest detections and the anticipated transition to a statewide EAB quarantine (which occurred in March 2018). Landowners should work with professional foresters to make management decisions related to EAB on their land. 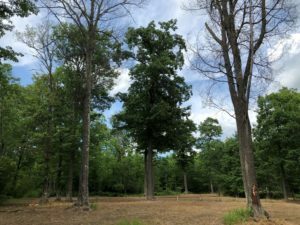 The silvicultural guidelines are intended to help make informed stand-level decisions regarding management of stands that are not yet infested by EAB and stands that are already impacted by the tree-killing beetle. They should be used along with other materials, including best management practices and other guidance documents, to develop appropriate management plans. Review existing management plans to determine if they need revision due to changes in EAB distribution, stand condition, market prices, etc. The guidelines also place a greater emphasis on assessing stand and site conditions before making management decisions. The document offers stand management alternatives for both upland and lowland stands, while recognizing that conversion of lowland ash stands to other forest types will be impractical in many cases. If you would like more information about emerald ash borer or these guidelines, visit the DNR EAB webpage or talk to your regional forest health specialist. 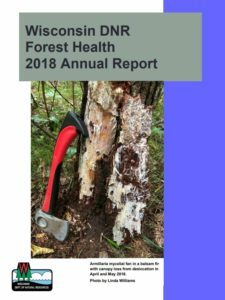 2018 Forest Health Annual Report now available. The 2018 report and others dating back to 2003 are available on the forest health publications page. Historical reports dating back to 1951 are archived and available upon request. Contact Marguerite Rapp at marguerite.rapp@wisconsin.gov for more information on the archived reports. By Todd Lanigan, forest health specialist, Eau Claire, Todd.Lanigan@wisconsin.gov, 715-210-0150. No caterpillars or egg masses were found in the 2018 jack pine budworm surveys. Done in the spring for caterpillars and the fall for egg masses, surveys help predict jack pine budworm defoliation in the coming year. Surveys were conducted in the west central part of the state, covering portions of Dunn, Eau Claire, Jackson, Monroe, Pierce and St. Croix counties. Caterpillars emerge in the spring and feed on host tree foliage. Egg masses are deposited on the tips of host tree foliage. In Wisconsin, jack pine budworm feeds on all native species of pine: jack, red and white. It is occasionally found on white spruce, but this has only been documented where spruce trees were located near an infested pine plantation. Jack pine budworm regularly cycles from low to high populations, with outbreaks occurring every 8-10 years on average. During an outbreak, defoliation from these caterpillars can be widespread and lead to growth loss, topkill and tree mortality. 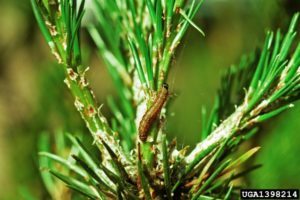 During a jack pine budworm outbreak, defoliation and mortality can be severe. 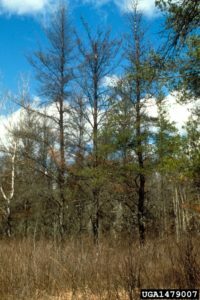 Wisconsin forests are overdue for an outbreak, with the last one occurring from 2005-2009, but annual surveys indicate that populations of jack pine budworm are still low enough to be undetected. Based on the 2018 surveys, jack pine budworm should not be a problem in 2019. Please remember to properly dispose of wreaths, trees and other holiday decorations from chain stores that may be infested with an invasive insect. 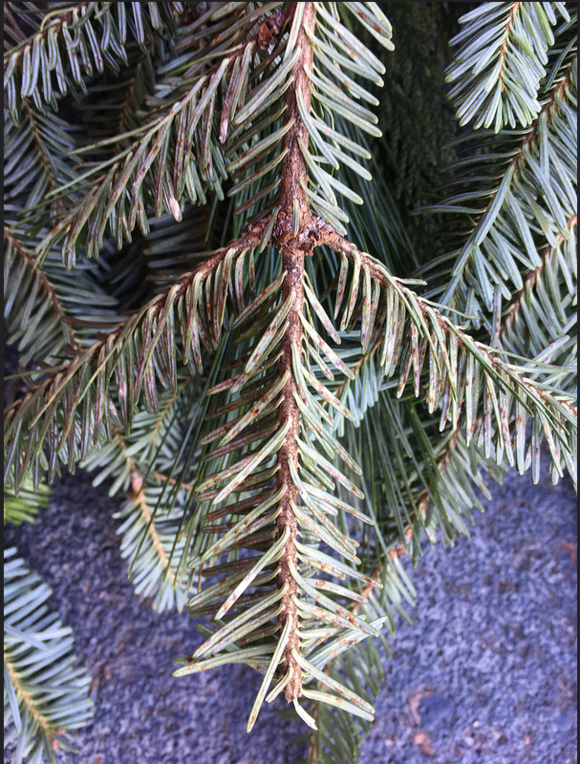 If you purchased any holiday wreaths, swags, boughs and other arrangements from chain stores, please dispose of them by burning or bagging them and putting them in the trash as they may be infested with an aggressive invasive insect that can harm Wisconsin’s native forests, Christmas tree farms, and even ornamental conifers in your yard. 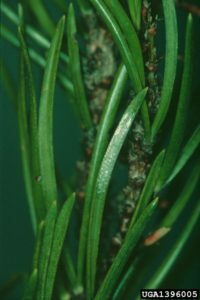 During this recent holiday season, Department of Agriculture, Trade and Consumer Protection (DATCP) inspectors found an invasive insect pest from Asia called elongate hemlock scale (EHS) on holiday wreaths, swags and boughs, and in arrangements of evergreen boughs in hanging baskets, porch pots, mugs and sleighs. These items came from suppliers in states where EHS is already established. This insect poses a risk to Christmas tree fields as well as native and ornamental coniferous trees in Wisconsin. To prevent the introduction of EHS to Wisconsin, DATCP officials are asking those who purchased the listed decorative items from chain stores in 2018 to properly dispose of them. 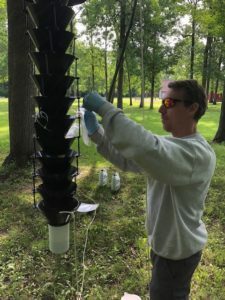 The Wisconsin DNR’s forest health team received funding to trap for non-native beetles in 2018. This project was funded by the US Forest Service through an Early Detection and Rapid Response (EDRR) grant. The project is complete, and we happily share that we did not find any non-native beetles! Forest health staff member Scott Schumacher hangs a Lindgren funnel trap to survey for non-native beetles. The Forest Service periodically provides funding to states to trap for non-native bark and ambrosia beetles. The goal of trapping is to detect, delimit and monitor newly introduced exotic beetles and to quickly assess and respond to newly detected infestations. We placed traps at 12 high-risk sites in Jefferson, Waukesha, Milwaukee, Racine, Manitowoc, and Brown counties. Sites were selected in collaboration with the Wisconsin Department of Agriculture, Trade and Consumer Protection and were based on proximity to large commercial port entries on Lake Michigan or recycling facilities for pallets and other waste packaging. Three Lindgren funnel traps (12 funnels stacked to look like a tree trunk) and lures were assembled at each site and checked every two weeks between early May and early August. Specimens collected from the traps were sent to a Forest Service taxonomist for identification. 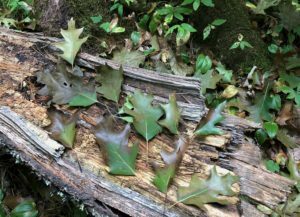 Oak wilt (OW) was confirmed for the first time in Bayfield and Douglas counties and in 16 new northern townships in 2018. The new OW infections occurred on a range of properties, including county, tribal, private, U.S. Forest Service and Board of Commissioners of Public Lands. Wisconsin Department of Natural Resources (DNR) forest health staff are working proactively with affected property managers and landowners to address these infections and prioritize disease prevention and detection in the future. Oak wilt distribution map. Confirmed counties are displayed in red. Confirmed townships are displayed in pink 6-mile square blocks. The greatest risk of overland transmission in northern Wisconsin is from April 15 to July 15, when fungal spores readily infect open wounds. Most of these new cases occurred during this time frame due to stem and branch damage. The primary causes of damage were roadside brush clearing, pruning, lot clearing and storm-caused branch breakage. Fungal spores may have come from diseased oak firewood and unprocessed wood recently transported into these areas. OW disease center. Oak on far left was infected through belowground root contact with tree damaged in lot clearing (far right). Dairyland Township, Douglas County (photo taken by Paul Cigan). If oak wilt is present in or within 6 miles of the county where you manage oak, your management activities may be affected by seasonal harvesting restrictions to reduce OW introduction and impact. Read DNR’s oak harvesting guidelines for more information and refer to the list below of new 6 square mile blocks by township and county to see if OW has been detected near your property. Please report any suspected oak wilt infections to your local DNR forester or regional forest health specialist and learn more about oak wilt identification and biology on the DNR oak wilt webpage. To learn more about firewood rules and how you can help reduce transmission of pests and diseases, including oak wilt, visit the DNR firewood page. Bronzed leaves fallen from infected oak. Leaves were observed beneath infected northern red oak. Cable Township, Bayfield County (photo taken by Paul Cigan).